Not a fan of the default skin - recommend "gray storm" from the Tools - Skins menu. Also lacks the indentation I was also missing in CherryTree. EDIT: also wanted to submit another program NoteCasePro http://www.notecasepro.com/download.php , which lists a portable version, but lack of bulleted lists in the free version just felt like crippleware. I’m sharing my launcher for AllMyNotes Organizer (AMNO) and a guide how you can make portable package. • Contact information: addresses, phones, call summary, chats. Many people believe that free-form format is better that traditional form-based - there is no limit at all. 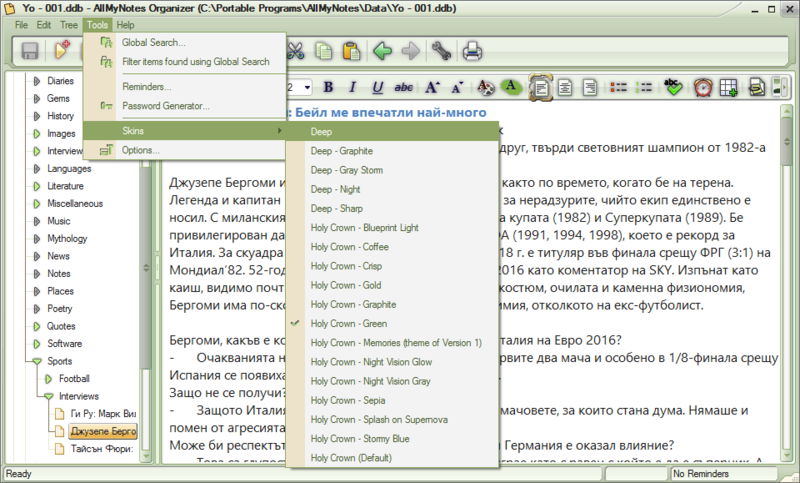 For some contacts single line of text is enough, and for others you can keep megabytes of dossier - whole branch of documents grouped in hierarchy of folders. • Trip information: addresses, hotels, itinerary, car rental, electronic tickets, historic sites, landmarks, walking tours and restaurants. • Financial information, bills, bank account information, record transactions, stocks, taxes, access codes. Restrict access by password to feel secure! • Make notes on customers, keep notes on personal purchases, customer comments, track client's time, track sales leads, evaluate resumes, organize inventory, dial phone number from PC, take notes on telephone messages, record all decisions, project planning. • Secure password management and Generator, for keeping access codes to your web-accounts and your data safely. Allow yourself to generate unique passwords for any web-site, save answers on secret questions, no need to keep data in your head! • Shopping: shopping list, prices, coupons, web-pages of online-stores with registration info, discounts and special offers. • Health, food, and dieting, fitness strategy, recipes. • Teachers can keep lectures, schedule, organize exercises, notes on students and decisions. 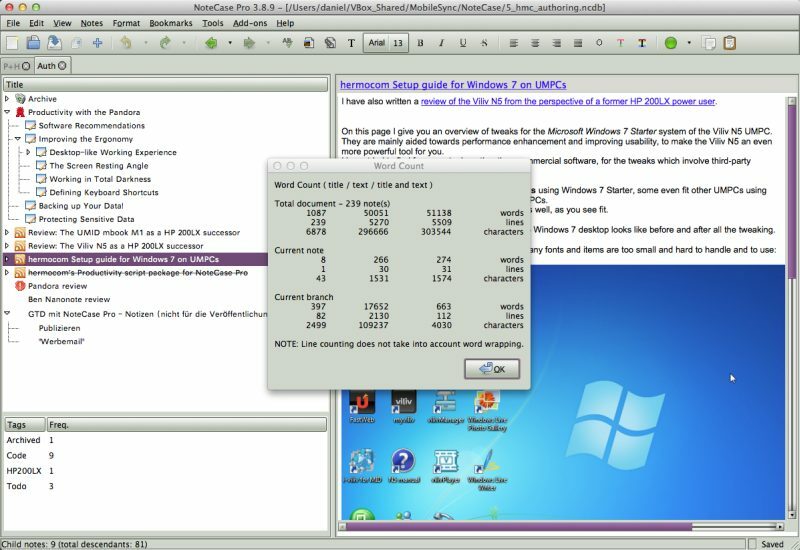 • Students can type lectures, quotes, keep schedule, do exercises and homework. • Project planning - use Tasks and Alarms to make it really efficient! • Make notes in courtrooms. Helps to do detective work. • TV programs: organize catalogue of favorite programs, schedule (use Alarms to never miss them! ), reviews, keep dossier on favorite stars, capture interesting quotes. • Capture news, track articles in periodicals. • Secure diary tool. Keep your private journal diaries encrypted, under password. • Note-taking: AllMyNotes is the best note-making tool, comfortably sort all your memos the way you want! • Enter patient information. Store medical histories and techniques. • Catalogue your DVDs and music - keep list of your CDs and DVDs, lyrics. • Sport: save results, championship dates, biography of your favorite players. • Genealogy tree, family records. • Kids: capture their achievements, funny cases, special dates and events. • Domestic pets: feeding, vaccination schedule, articles and recommendations. • A 1000+ other uses. - Launcher makes AllMyNotes Organizer fully portable. No traces are left behind on local computer. - Supports all versions: deluxe, free, "portable" and special giveaway builds. - It's an empty launcher: holds no registration info or any AMNO's program files. - Extract 'AllMyNotes_Organizer_Launcher.zip' to location of your choice (USB, portable hard drive, notebook, desktop computer,...). - If you have already installed AMNO just copy all folders and files from the main AMNO directory into App folder in your portable package. - If you do not have AMNO on your computer, download the installer. - Open the installer with 7-Zip (HaoZip,...). - Extract all folders and files (except $PLUGINSDIR folder) into App folder in your portable package. - Use 'AllMyNotesOrganizer.exe' in AllMyNotes Organizer Portable folder to start AllMyNotes Organizer Portable. 'AllMyNotes.ini' file holds program's settings. When you are updating your portable package, do not replace (overwrite) this file if you want to keep your old settings. Last edited by 3K3 on Mon Dec 10, 2012 10:11 am, edited 1 time in total. Thanks for posting. It's not critical for me that the launcher is stealth, but it is critical that I get a launcher that works well on Win7. Tested, everything as expected. Thanks for your work. webfork wrote: Thanks for posting. It's not critical for me that the launcher is stealth, but it is critical that I get a launcher that works well on Win7. Midas wrote: Tested, everything as expected. Thanks for your work. Thank you Midas for your feedback and you are welcome. I'm happy to give something back to the portable community. Initial description sounded pretty fantastic but actually testing the program and I felt a little short on options. Here's the breakdown on differences between free and paid. Also, I posted about this program a while back but thought the "Organizer" bit was something else from the same developer. Anyways... merging threads. webfork wrote: EDIT: also wanted to submit another program NoteCasePro http://www.notecasepro.com/download.php , which lists a portable version, but lack of bulleted lists in the free version just felt like crippleware. Last edited by Midas on Mon Feb 16, 2015 4:11 am, edited 1 time in total. Haven't tested the app at all. but as far as I know these skins are available in the commercial version only. In my opinions all these free versions of commercial outliners are useless. However in for me AllMyNotes is one of the better commercial outliners, at least fully portable and stealth. In my opinions all these free versions of commercial outliners are useless. I thanked you for your tip about the portable installation of The Journal but my comment somehow disappeared. So- thank you again! The information you provided is nowhere to be found at The Journal web-site. The program looks portable and stealth. I read your comment on BdJ, glad I could help you. AllMyNotes: tool for note-taking is worth appreciating. 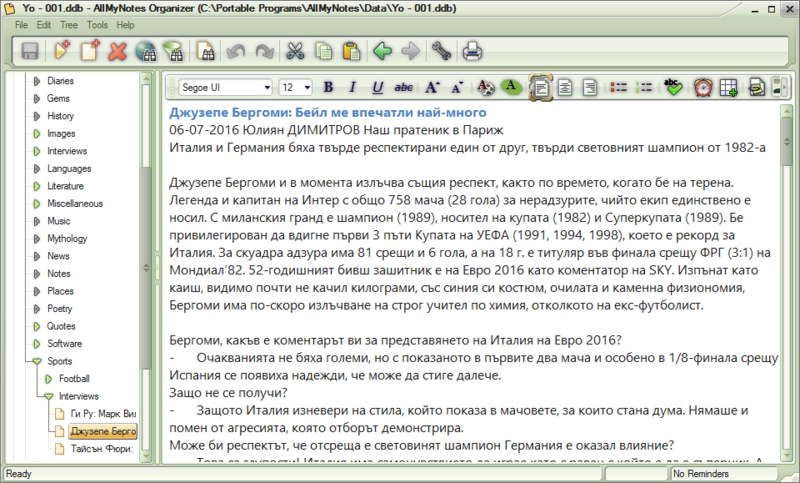 the forum Portable Freeware Submission in the period 2012-2016. At present, the version free of charge is called "Lite Edition". really free for all users at home, school, professional work and so on. that it doesn't cause the lack of the usefulness of the program. Portable versions are easy available besides installation versions. news. Such versions of programs for information managing are still rare. development: efficiency, easy of daily use, speed and reliability of the database. AllMyNotes Lite is good, checked and constantly developed universal text outliner. In my opinion, he should be quickly accepted to The Portable Freeware Collection. Re: AllMyNotes: tool for note-taking is worth appreciating. As noted in the FAQ, you're welcome to add it to the database, but it probably won't get my vote. I found it to be a cool program but I was frustrated that some fairly standard editor features were under the "delux" view. Other users will certainly find the program more than adequate and are welcome to vote for it. Also I'm not sure it was actually portable. Someone tried to build a launcher and posted about it in the other thread, which I'll merge with this one for ease of search.